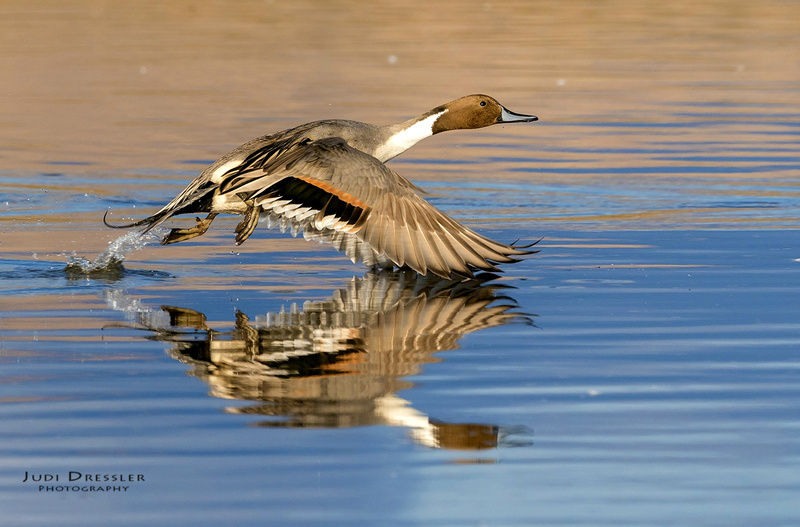 I think Northern Pintails are one of the most elegant ducks, and so I was thrilled to get this shot of one taking off so close to the water, with a wonderful reflection of him. This shot was taken at Bosque del Apache National Wildlife Refuge, well known for sandhill cranes and snow geese in the winter, but there are also many hundreds of pintails there, along with other wildlife. From Audubon’s website: “Widespread across North America, Europe, and Asia, the Northern Pintail is probably one of the most numerous duck species in the world (although outnumbered by the omnipresent Mallard). Slim and long-necked, it has an elegant appearance both on the water and in flight. Pintails are wary at all seasons, and become very secretive during the flightless stage of their molt in late summer. Photo taken on December 4, 2017, at Bosque del Apache in NM.